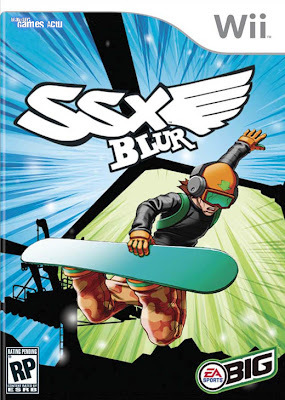 SSX Blur is one of the best games out on the Wii so far and I'm not just saying that. This is not a "Red Steel" type of game that you will either hate or like as others have been saying. In my opinion this game is a finely crafted piece of gaming goodness. EA has gone the extra mile in making the game rewarding, fun and difficult all at the same time. It will have you coming back for more and you will be finding yourself playing this game for hours on end without even knowing it. The levels are comprised of some old (but still good) areas to snowboard and trick your way down and some new ones. Personally the racing aspect is my least favorite part since you just have to speed your way through the level and not really have to concentrate on tricking. It is fun but not as much fun as doing the tricks and especially the immensely enjoyable Uber Tricks. The game has literally a ton of unlockable content and will keep you playing for hours just to see what you can unlock next. The unlockables range from new characters, new boards, character art and more. The control for this game has been debated across multiple forums and reviews across the Internet and gaming magazines. This game does require you to learn how to play from scratch. However, I will not mark off points for this game just because there is a learning curve. This is a totally new way to play SSX with the Wii remote and Nunchuck and it works perfectly fine and smooth after patience and practice. Within the first day of owning this title I was performing spins, back flips, grabs and the all important Uber Tricks. The Uber Tricks are what makes the game one of the best snowboarding games you play in a while. Are they hard to perform? At first, yes they are. These tricks are special and you are supposed to be good at the game in order to perform them, its not going to just give the trick to you by you "kinda" making the right gestures with your Wii remote. You will need to get the correct amount of air and then you will also have to perform the trick at the right speed (which you will get a feel for) and make sure you push and hold the A button before you start making the gesture. This is a common mistake in that some have started making the gesture a split second before holding the A button thus making the Uber Trick not work. Also, you will need to make big sweeping type gestures with the Wii remote for the game to recognize what trick you are trying to do. Once you master this system of doing the Uber Tricks, it will open up the entire game to you and you will be the king of the snowhill. You will also not want to stop playing this game once you master the controls. TIP: Go to one of the Half Pipes and instead of choosing "Continue" choose "Cancel" what this will do is cancel the timed run for the Half Pipe and give you an infinite amount of time to practice Uber Tricks and landing (just double tap the A button for a quick landing). This will make you a pro in no time. You can also practice the Uber Tricks in the option menu to get a good feel for them. Try them for a bit but I suggest going right to the Half Pipe for true practice. This game has a very good soundtrack only topped by SSX3. Some tracks stand out more than others but as a whole the music is great and fits the action perfectly. The music helps the sense of awe you get when you perform the Uber Tricks as it will change and pull back for great effect. The graphics are some of the best seen on the Wii yet. Lense flare and Bloom abound all over the place on the characters and levels. The particle system, while subdued, is great too and lights up the screen when it is being used. The snow and weather effects are naturally a star in the show as well with snow covering the riders and blizzards blowing through the air. The entire package is extremely clean and really there is no "fault" you can really see with the look of the game. The framerate drops from 60 fps to 30 fps quite a bit throughout the game, it is noticeable but never hurts game play and never gives you the sense that the game is "chugging along". For the most part the game runs fine and you really shouldn't have a problem with the framerate changes. In the end, this game is all about quality and fun. Getting that rush you feel while performing the Uber Tricks with the new Wii-only controls is not an experience to be missed. I highly recommend this and in my opinion it is the best thing since Zelda on the Wii since launch day. Buy it, practice it and enjoy the amazing new way to play SSX. Wow what a breath of fresh air. I am very happy that I read this and will now be purchasing the title. This title has been very controversial but I never knew why. The game looked fantastic and all of the other title were amazing. All I have to tell you is, give it a chance and don't give up. DON'T do the tutorial for the Uber Tricks, its pointless. The way I said to practice the Uber's is the only way to go in my opinion. The Half Pipe and infinite time are you strongest friend. Practice the motions a little bit in the option menu then go right to the Half Pipe. Happy snowboarding!!! Its an awesome game and after a day or so of practice you will think so too.